A Season of Happiness - MONEY MATTERS | Issue 23 - Auctions – Going, Going, Gone! Auctions – Going, Going, Gone! Watching the antics of bidders at an auction can be like a comedy in mime - the apparently casual raising of a catalogue; a seemingly habitual stroke of the nose, or a tug of an ear-lobe; an almost imperceptible nod of the head - these are signals to the auctioneer. “The bid stands at 450,” he declares, “Do I hear 5?” That means 500, of course. A lady at the back dabs a handkerchief surreptitiously to her lips. The auctioneer responds: “I have 500. Do I hear 6?” In this ambiguous environment, mere observers not participating in the bidding need to watch their body-language, or they could be up for an embarrassing time explaining their unwitting indiscretion. Yes, auctions are interesting and entertaining, pretty much like any show; and many are as well-scripted and -choreographed. They can be the ideal venue to pick up a bargain, or alternatively to get stuck with an expensive lemon. Most things can come up for bidding – cars, houses and farms, the contents of deceased estates, artworks; anything, in fact, which the owner wants to sell quickly and for a price higher than a lone buyer would be prepared to pay. In this market place, competition is the driving force. Small, sought-after items may be put up individually, whereas those which won’t command a decent price on their own are included in lots, usually comprising items of a similar nature. These tend to be quite popular with collectors, especially if there is a particular piece included that they have been seeking. Having to take the rest isn’t an issue, as long as their perceived value of the item in question is equal to or less than the price they have to bid. Obviously, they will be hoping that nobody else is interested and they can score a bargain; sometimes they will; not always though. There may be another bidder just as keen to buy the lot, not necessarily to acquire the same object. Their passion might be stronger, their pocket deeper; or there could be more than one ring-in loitering among the spectators. These may be buddies of the owner who wants top dollar; or stooges of the auctioneer - the higher the selling-price, the bigger the commission. I’m talking here about the smaller, lesser-known auction houses; I can’t believe Sotheby’s or Christie’s would risk their proud reputations by stooping so low! 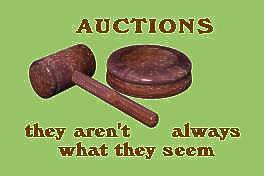 Mind you, any auction can attract the nuisance game-player who has no intention of buying, but just wants to see how high they can force the bid before pulling out, simply because they get a kick out of it. Don’t think it never happens - it does. Bogus bidders are, perhaps, more common at the high-value end of the scale. Some house auctions are rigged – anyone who says they aren’t is either super-naïve or telling porkies! The price-hikers look just like any other average Joe: they have to in order to blend in. A prior meeting with the auctioneer dictates their purpose. They might be told: “When I have a drink of water, sit tight; two sips - raise the bid.” The idea is to drive the selling price above the reserve: this is the minimum the owner is willing to accept. Once the reserve is exceeded, the ring-in’s job is to continue pushing in accordance with the auctioneer’s signals. When the reserve isn’t reached, the auction may be closed; or it could be paused to broker possibilities between the owner and the last bidder in the hopes of reaching a mutual agreement. This can even take place if that bidder was the stooge because, for the sake of appearances, it must seem to most that the auction is all on the up-and-up. Occasionally, the same halt to the proceedings can be triggered when the ring-in’s bid fails to be over-called by a genuine buyer. Then, following a faked discussion, it may be declared to the real buyers that this bidder has pulled out and the auction can continue; alternatively, the sale can be discontinued altogether.